image. Photos are coming soon. It will be interesting! any of the interior to learn more about it. in the Czech Republic and Estonia. evening, entertainment as a whole. as a secret until opening. only optimal planning idea? Then, order separately this module, we will work it out. that you need some kind of modules additionally! The layout idea is the base of the design project. There we place all the objects of your space, from the furniture to the walls. The layout idea plan is not about defining the kind of furniture or the color of the walls, but, at the same time, it is one of the main steps that decide these factors, it is about whether you are comfortable in the interior or not. What does the work look like and what is included in the product? We select the best layout option for the space l based on your wishes, and after it is approved we prepare two documents: a layout idea and a layout plan with all the measurements. In the case the proposed option doesn’t work for you, you are free make changes and then we come up with new proposals based on them. This service includes a possibility to make changes up to three times. Yes. Some of our clients know from the beginning what they want to receive and manage the creation for their layout ideas on their own. In this case, you shouldn’t overpay: just bring your layout plan drawn at a specific ratio relative to the actual size of objects inside and on this foundation we will develop the rest modules that you choose. What else should we order? 1. 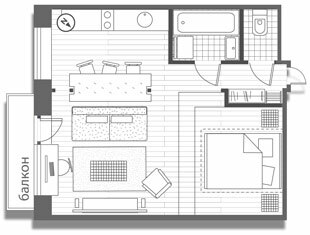 If you you are not sure yet what your space should look like, we recommend that you to order a layout plan and the rest you will be able to order later when it comes time for construction. In this case, we recommend that you also add the "Projection" module with which you will be able to see your plan in 3D. 2. If you are planning to do the construction work and you want to select the furniture, wall color and so on by yourself (and you only need someone to help you decide the layout), simply add the «Project documentation» module. Any worker will be able to construct your space with this and you will only need to select colors and furniture. You can also add the "Projection" module. 3. If you need an understanding of what furniture, what color, etc. that you want before starting construction, we recommend you buy the "Project documentation" and "Specification" modules as well. You can also add 3D-rendering modules such as "Visualization", "Perspective" and "Panorama" which allow you to see photorealistic images of the future space. Above is the fixed price which does not increase in the case you where buy units at different times, for example, a month or even six months later. This price is valid for the spaces from 40 to 150 sq.m. Also, if you select multiple modules of photorealistic images you pay for the creation of a model with textures only once, and the cost of additional modules increases only depending on the way of displaying them. Please use the "Cost Calculator" below to better determine the cost of several modules. 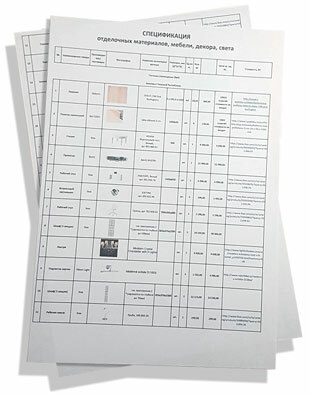 Project documentation is a complete set of documents, excluding the «layout Idea» module, with which any worker will be able to construct your space, starting from dismantling, and finishing through a multimedia connection plan. Through the project documentation plan, you will only have to choose a style and then decide on the furniture and fittings. We prepare the project documentation based on the plan provided by you or our approved layout idea plan and then we give it to you for approval. If you have any corrections and suggestions, we add them to the documentation. This service includes three sets of corrections. Yes, if you are only at the planning stage and the construction work is not yet planned to start soon. Then you should take a chance simply to dream and to imagine your future space and only order the "Layout Idea" and "Projection" modules. But if the construction work is to be planned soon, you will need the project documentation. 1. If you only need construction work done and wish to deal with furniture and interior coloring selection later, you should order the «Layout Idea» module and we will come up with your space and all documentation you need. You can also add the "Projection" module to see your future plan in 3D photorealistic images. 2. If you wish to order not only the construction work but also want to understand the kind of furniture that will be used in your space, the color of the walls and so forth, we recommend you to order the "Specification" module as well and we will select the style, make up and an approved-by-you list of furniture, materials for walls and so on (see «Specification» module). 3. If you would love to see the space of your dreams on the photorealistic images, you can order, in addition to "Specification" module, more of the modules such as "Visualization", "Perspective" and "Panorama". Projection is a low-cost axonometric model of a space based on the layout idea. 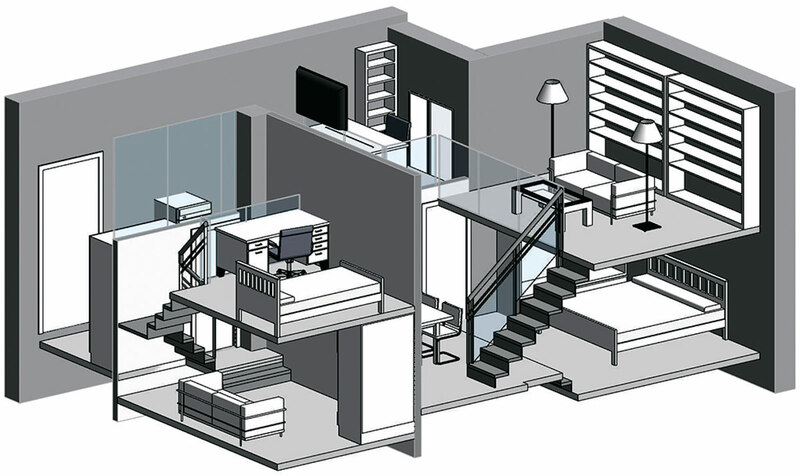 This is the minimum needed of a design project, which may help see the layout of the future interior in a three-dimensional space without textures. You create your own, or order the "Layout idea" module, and after its approval we start modeling. You get up to 4 camera angles for each room of the future space. This product includes the possibility of making 3 sets of amendments. This module is optional, but we recommend it if you do not plan to order any of the three options of 3D-renderings of your interior: "Visualization", "Perspective", "Panorama". 1. If you only need to imagine your future interior, you only need the "Layout idea" module and we will create on the base of it an axonometric projection. You can also provide your layout idea and then you would only need the "Projection" module. 2. If you are already planning to start construction and you don’t need to understand the style of the interior, you will also need the "Project documentation" module in addition to the layout idea so that the workers can perform the construction. 3. If you need an understanding of the future interior style, you are planning to start construction and you need only an axonometric projection of the future interior, you should add to the project the «Specification» module in addition to the layout idea and project documentation. However, with such a combination, we recommend to order one of the photorealistic interior display models such as "Visualization", "Perspective" and "Panorama" instead of "Projection" module in order to see future interior in detail. Specification is the basis of a stylistic component of your project as well as a detailed list of all its design elements, such as wall covering, decoration, furniture, electronics, lighting, etc. With specification in the design project, you don't have to waste your time on choosing the style and the selection of all its components during construction. We choose the style of the future interior on the layout idea, we approve it by you and proceed to the selection of all its visual components: color of the walls, decor, lighting, furniture, electronics, etc. We create the specification in an electronic form, accompanying each item with a reference to a store where you can buy it. This list contains non-custom items available in shops of your city at the time of the list creation, and includes the possibility of making 3 sets of amendments. You can, if you plan to choose the interior styling by yourself throughout the course of the construction, it will be enough for you to order the "Layout idea" and "Project documentation" modules in order to start creating your interior. 1. If you only need to decide on the future interior styling and you have your own layout idea, you only need the "Specification" module with which we will help you pick all the ingredients. 2. If you are already planning to start construction, you will need the "Project documentation" module in addition to the layout idea. In this case you will have almost a complete design project, with defined style and all necessary documentation for the workers. 3. The specification, working documentation and layout idea modules in the design project provides an opportunity to see your future space in photorealistic 3D-renderings in the "Visualization", "Perspective" and "Panorama" modules. Visualization is the classic method of photorealistic display of the future interior. 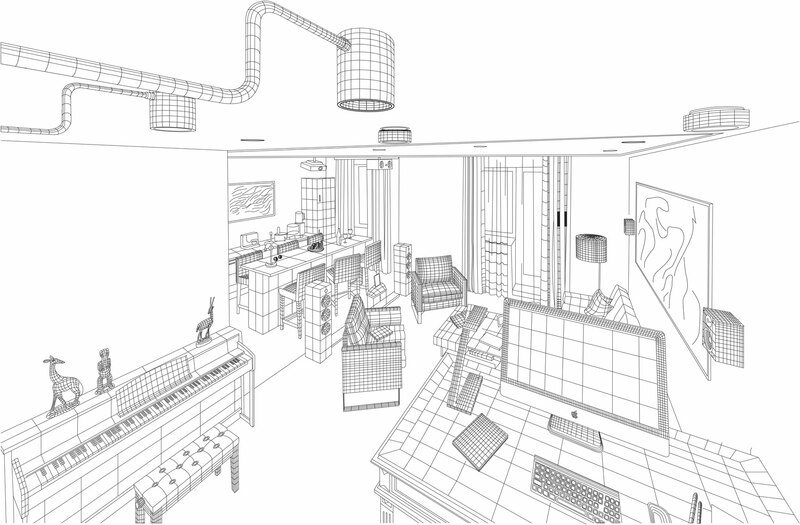 Visualization helps to see the interior of the future interior as accurately as possible from different angles. We create a model of the space on the basis of the "Project documentation" and "Specification" modules, and then add textures to it and create "pre-visuals" or previews of your space. You make the changes, if you wish, and then we do the final visualizations. 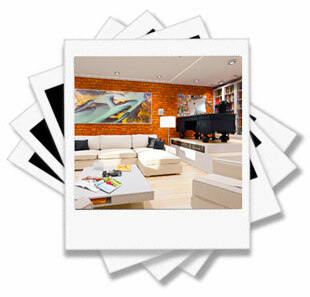 This product includes one set of amendments and anywhere from 20 to 30 images. This module is optional, but we recommend it if you order "Project Documentation" and "Specification" modules as it allows you to see your future space as if these were real photos. What is better: visualization, projection or panorama? Each of the varieties of photorealistic display provides a visual understanding of your future interior. However, each of them has its own strength that others don't have, so we recommend ordering them together for a better view, especially since the price does not increase much. 1. Visualization allows you to see a photorealistic image of your interior from the most effective angles, there are from 20 to 30 images. 2. Perspective allows you to see a photorealistic image of your interior as objectively as possible from 4 different angles as the number of walls in your interior, by balancing all objects within it as a whole, without separating it onto multiple shots. 3. Panorama allows you to see a photorealistic image of your interior, as if you were already inside. 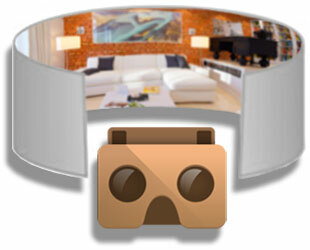 The virtual reality glasses Cardboard are also included in this module in addition to the virtual panoramas the amount of which corresponds to the number of rooms. By using the glasses with your smartphone, you can freely explore your interior "from the inside". Perspective is a non-standard way of presenting a photorealistic image of the future interior. In contrast to the «Visualization» module which consists of individual frames from different angles, "Perspective" helps see the interior more objectively. This module is useful if you prefer to judge the interior as a whole. This product includes one set of amendments and 4 perspectives from different angles depending on the amount of sides. This module is optional, but we recommend it if you order “Project Documentation” and “Specification” modules” as it allows you to see your future space as if these were real photos. Panorama is an innovative way of creating photorealistic image of the future interior. It allows you to see the interior through virtual reality glasses Cardboard, which are also included in this product, through the use of your smartphone. 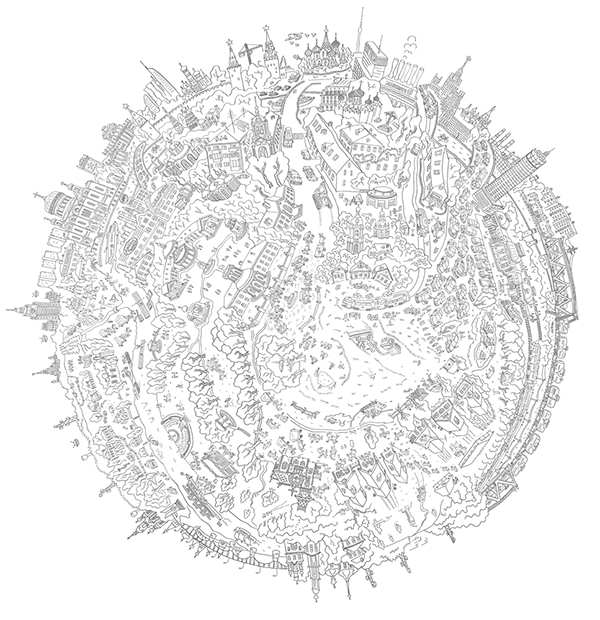 This module most accurately conveys the impression of the future space. We create a model of the space based on the "Project documentation" and "Specification" modules, and then add textures to it and create "pre-visuals" - or previews of your space. You make changes, if you wish, and then we do the final visualizations. This product includes one set of amendments and 1 panorama for each 20 sq.m. of the interior (or depending on the number of rooms in case the number is greater than the average size of 20 sq.m. of the space) and virtual reality glasses Cardboard. time on the same process later. of your space to calculate the cost. the cost may be different. The Cost Calculator estimates the interiors of from 40 to 150 m2. If your metric area is a little more or a little less, try to fit it in the settings, it will only lead to a small error in the price but will give an idea of the order of our prices. Please enter the number of square meters of your space to calculate the cost. There is no need to add "Projection" module together with the "Visualization", "Perspective" or "Panorama" modules, therefore, we disabled this feature. We provided this so you do not overpay for the same thing twice. The fact is that the "Projection" module is a simple way to visualize your space without a stylistic component, so when you order it together with the high-quality modules such as the "Visualization", "Perspective" or "Panorama" modules, you risk to pay twice for similar services. That is why we have disabled this combination. The "Specification", "Visualization", "Perspective" and "Panorama" modules can only be ordered only if the "Project Documentation" module is in the basket. The fact is that for the selection of stylistic interior components (the "Specification" module), we need to develop a framework first: the documentation that is included in the "Project Documentation" module and will allow us to "string together" the stylistic idea of your space. The "Specification" module is needed just for the subsequent creation of photorealistic modules namely "Visualization", "Perspective" or "Panorama", as said before, we need to make a detailed specification of stylistic components of the future space. The "Visualization", "Perspective" and "Panorama" modules can only be ordered only if there is the "Specification" module in the basket in addition to the already added “Project Documentation” module. Start to fill the basket, so that we can give you more details on the procedure of work on the order. The variation made of one "Project documentation" module implies that you provide us with your own layout idea to scale and the size of the objects inside, and based on this, we develop all the necessary project documentation for the workers. When we are already in the process of construction, you will only have to choose the style of your interior and make up your mind as to which furnishings and décor elements you would like. Each of these phases includes three sets of amendments. This combination consists of two phases. We select the best layout idea for your space based on your wishes, and after its approval we prepare two documents: a layout idea and a measured plan of the layout idea. With these documents the workers can start construction. When we are already in the process of construction you will only have to choose the style of your interior and make up your mind as to which furnishings and décor elements you would like. Each of these phases includes three sets of amendments. This combination of these two phases implies that you provide us with your own layout idea to scale and size of the objects inside, and based on this, we propose a stylistic idea by using examples of other interiors and your wishes. Then, we prepare all the necessary project documentation with which workers can start construction. We also make up a detailed specification of furniture, lighting, decoration materials and other decorative elements based on the approved style. Having the specification and an understanding of the interior style, you will be able to quickly arrange your space at the end of construction by simply following the list. Each of these phases includes three sets of amendments. This combination of these two phases implies that you provide us with your own layout idea to scale and size of the objects inside, and based on this, we create an axonometric projection of your space from 4 different angles. After this we develop all the necessary project documentation for the workers. When we are already in the process of construction you will only have to choose the style of your interior and make up your mind as to which furnishings and décor elements you would like. Each of these phases includes three sets of amendments. This combination consists of three phases. We select the best layout idea for your space and after your approval propose a stylistic idea by using examples of other interiors and based your wishes. Then, we prepare all the necessary project documentation: a layout idea and a measure plan of the layout idea with which workers can start construction. We also make up a detailed specification of furniture, lighting, decoration materials and other decorative elements based on the approved style. Having the specification and an understanding of the interior style, you will be able to quickly arrange your space at the end of construction by simply following the list. Each of these phases includes three sets of amendments. This combination consists of three phases. We select the best layout idea for your space based on your wishes, approve it with you and create an axonometric projection of the space from 4 different angles which allows to see you future interior in a three-dimensional model. 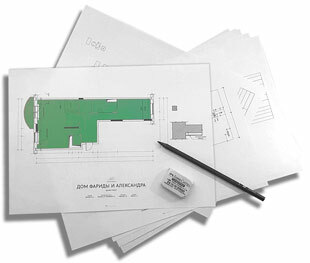 After its approval we prepare all the necessary project documentation: a layout idea and a measure plan of the layout idea. With these documents the workers can start the construction. When we are already in the process of construction you will only have to choose the style of your interior and make up your mind with the furnishings and décor elements. Each of these phases includes three sets of amendments. This combination consists of four phases. We select the best layout idea for your space based on your wishes, then approve it with you and create an axonometric projection of the space from 4 different angles. Then, we propose a stylistic idea by using examples of other interiors and your wishes and make up a detailed specification of furniture, lighting, decoration materials and other decorative elements based on the approved style. Following the specification, we prepare all the necessary project documentation with which workers could start the construction work. Having the specification and an understanding of the interior style, you will be able to quickly arrange your space at the end of construction by simply following the list. Each of these phases includes three sets of amendments. This is the simplest variation of a single phase. We select the best layout idea for your space based on your wishes, and after its approval we prepare two documents: a layout idea and a measured plan of the layout idea. This product also includes three sets of amendments from your side. 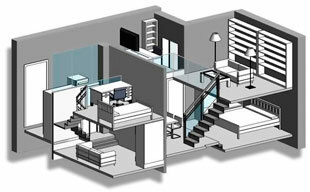 This combination of two phases allows you to plan and to see your future interior in a three-dimensional model. We select the best layout idea for your space based on your wishes, approve it with you and create an axonometric projection of your space from 4 different angles based on the information. Each of these phases includes three sets of amendments. This combination of three phases implies that you provide us with your own layout idea to scale with the size of the objects inside, and based on this, we create an axonometric projection of the space from 4 different angles. Then, we propose a stylistic idea by using examples of other interiors and your wishes and make up a detailed specification of furniture, lighting, decoration materials and other decorative elements based on the approved style. Then, we prepare all the necessary project documentation with which workers can start construction. Having the specification and an understanding of the interior style, you will be able to quickly arrange your space at the end of construction by simply following the list. Each of these phases includes three sets of amendments. This is the simplest variation of a single phase. You provide us with your own layout idea, we create an axonometric projection of your space from 4 different angles on its base. This product includes three sets of amendments. This combination consists of four phases. We select the best layout idea for your space based on your wishes, then we propose you a stylistic idea and create a photorealistic model of your space. At the same time we make up a detailed specifications list of furniture, lighting, decoration materials and other decorative elements based on the approved style. When the specifications list is done, we approve it with you and present previews of photorealistic images of your interior (a package of 20-30 angles of camera is included in the "Visualization" module). After the approval of the images, we create the final angles of "Visualization" in high resolution and proceed to the final stage: the preparation of all the necessary project documentation with which workers can start the construction. Having the specification and an understanding of the interior style, you will be able to quickly arrange your space at the end of the construction work by simply following the list and the photorealistic images. Three sets of amendments are included in each of phases of work with documentation and one set for the work with photorealistic images. This combination of three phases implies that you provide us with your layout idea to scale and the size of the objects inside, then we propose a style idea and create a photorealistic model of your space. At the same time we make up a detailed specifications list of furniture, lighting, decoration materials and other decorative elements based on the approved style. When the specifications list is done, we approve it with you and present previews of photorealistic images of your interior (a package of 20-30 angles of camera is included in the "Visualization" module). After the approval of the images, we create the final angles of "Visualization" in high resolution and proceed to the final stage: the preparation of all the necessary project documentation with which workers can start the construction work. Having the specification and an understanding of the interior style, you will be able to quickly arrange your space at the end of construction by simply following the list and the photorealistic images. Three sets of amendments are included in each of phases of work with documentation and one set for the work with photorealistic images. This combination consists of four phases. We select the best layout idea for your space based on your wishes, then we propose a stylistic idea and create a photorealistic model of your space. At the same time we make up a detailed specifications list of furniture, lighting, decoration materials and other decorative elements on the basis of the approved style. When the specifications list is done, we approve it with you and present previews of photorealistic images of your interior (a package of 4 different angles of camera included in the "Perspective" module). After the approval of the images, we create the final angles of "Perspective" in high resolution and proceed to the final stage: preparation of all the necessary project documentation with which workers can start construction. Having the specification and an understanding of the interior style, you will be able to quickly arrange your space at the end of construction by simply following the list and the photorealistic images. Three sets of amendments are included in each of phases of work with documentation and one set for the work with photorealistic images. This combination of three phases implies that you provide us with your layout idea to scale with the sizes of the objects inside, then we propose a stylistic idea and create a photorealistic model of your space. At the same time we make up a detailed specifications list of furniture, lighting, decoration materials and other decorative elements based on the approved style. When the specifications list is done, we approve it with you and present previews of photorealistic images of your interior (a package of 4 angles of camera is included in the "Perspective" module). After the approval of the images, we create the final angles of "Perspective" in high resolution and proceed to the final stage: the preparation of all the necessary project documentation with which workers can start construction. Having the specification and an understanding of the interior style, you will be able to quickly arrange your space at the end of the construction work by simply following the list and the photorealistic images. Three sets of amendments are included in each of the phases of work with documentation and one set for the work with photorealistic images. This combination consists of four phases. We select the best layout idea for your space based on your wishes, then we propose a stylistic idea and create a photorealistic model of your space. At the same time we make up a detailed specifications list of furniture, lighting, decoration materials and other decorative elements on the basis of the approved style. When the specifications list is done, we approve it with you and present a package of previews of photorealistic images of your interior (1 panorama for each 20 sq.m. included in the "Panorama" module). After the approval of the images, we create the final panoramas in high resolution and proceed to the final stage: preparation of all the necessary project documentation with which workers can start construction. Having the specification and an understanding of the interior style, you will be able to quickly arrange your space at the end of construction by simply following the list and the photorealistic images. Three sets of amendments are included in each of phases of work with documentation and one set for the work with photorealistic images. This combination of three phases implies that you provide us with your layout idea to scale with the sizes of the objects inside, then we propose a stylistic idea and create a photorealistic model of your space. At the same time we make up a detailed specifications list of furniture, lighting, decoration materials and other decorative elements based on the approved style. When the specifications list is done, we approve it with you and present a package of previews of photorealistic images of your interior (1 panorama for each 20 sq.m. included in the "Panorama" module). After the approval of the images, we create the final angles of "Perspective" in high resolution and proceed to the final stage: the preparation of all the necessary project documentation with which workers can start construction. Having the specification and an understanding of the interior style, you will be able to quickly arrange your space at the end of the construction work by simply following the list and the photorealistic images. Three sets of amendments are included in each of the phases of work with documentation and one set for the work with photorealistic images. This combination consists of four phases. We select the best layout idea for your space based on your wishes, then we propose a stylistic idea and create a photorealistic model of your space. At the same time we make up a detailed specifications list of furniture, lighting, decoration materials and other decorative elements on the basis of the approved style. When the specifications list is done, we approve it with you and present previews of photorealistic images of your interior (a package of 20-30 angles of camera included in the "Visualization" module and a package of 4 angles of camera is included in the "Perspective" module). After the approval of the images, we create the final images in high resolution and proceed to the final stage: preparation of all the necessary project documentation with which workers can start construction. Having the specification and an understanding of the interior style, you will be able to quickly arrange your space at the end of construction by simply following the list and the photorealistic images. Three sets of amendments are included in each of phases of work with documentation and one set for the work with photorealistic images. This combination of three phases implies that you provide us with your layout idea to scale with the sizes of the objects inside, then we propose a stylistic idea and create a photorealistic model of your space. At the same time we make up a detailed specifications list of furniture, lighting, decoration materials and other decorative elements based on the approved style. When the specifications list is done, we approve it with you and present a package of previews of photorealistic images of your interior (a package of 20-30 angles of camera included in the "Visualization" module and a package of 4 angles of camera is included in the "Perspective" module). After the approval of the images, we create the final angles of "Perspective" in high resolution and proceed to the final stage: the preparation of all the necessary project documentation with which workers can start construction. Having the specification and an understanding of the interior style, you will be able to quickly arrange your space at the end of the construction work by simply following the list and the photorealistic images. Three sets of amendments are included in each of the phases of work with documentation and one set for the work with photorealistic images. This combination consists of four phases. We select the best layout idea for your space based on your wishes, then we propose a stylistic idea and create a photorealistic model of your space. At the same time we make up a detailed specifications list of furniture, lighting, decoration materials and other decorative elements on the basis of the approved style. When the specifications list is done, we approve it with you and present previews of photorealistic images of your interior (a package of 20-30 angles of camera included in the "Visualization" module and a package of several images - 1 panorama for each 20 sq.m. included in the "Panorama" module). After the approval of the images, we create the final images in high resolution and proceed to the final stage: preparation of all the necessary project documentation with which workers can start construction. Having the specification and an understanding of the interior style, you will be able to quickly arrange your space at the end of construction by simply following the list and the photorealistic images. Three sets of amendments are included in each of phases of work with documentation and one set for the work with photorealistic images. This combination of three phases implies that you provide us with your layout idea to scale with the sizes of the objects inside, then we propose a stylistic idea and create a photorealistic model of your space. At the same time we make up a detailed specifications list of furniture, lighting, decoration materials and other decorative elements based on the approved style. When the specifications list is done, we approve it with you and present a package of previews of photorealistic images of your interior (a package of 20-30 angles of camera included in the "Visualization" module and a package of several images - 1 panorama for each 20 sq.m. included in the "Panorama" module). After the approval of the images, we create the final angles of "Perspective" in high resolution and proceed to the final stage: the preparation of all the necessary project documentation with which workers can start construction. Having the specification and an understanding of the interior style, you will be able to quickly arrange your space at the end of the construction work by simply following the list and the photorealistic images. Three sets of amendments are included in each of the phases of work with documentation and one set for the work with photorealistic images. This combination consists of four phases. We select the best layout idea for your space based on your wishes, then we propose a stylistic idea and create a photorealistic model of your space. At the same time we make up a detailed specifications list of furniture, lighting, decoration materials and other decorative elements on the basis of the approved style. When the specifications list is done, we approve it with you and present previews of photorealistic images of your interior (a package of several images - 1 panorama for each 20 sq.m. included in the "Panorama" module and a package of 4 angles of camera is included in the "Perspective" module). After the approval of the images, we create the final images in high resolution and proceed to the final stage: preparation of all the necessary project documentation with which workers can start construction. Having the specification and an understanding of the interior style, you will be able to quickly arrange your space at the end of construction by simply following the list and the photorealistic images. Three sets of amendments are included in each of phases of work with documentation and one set for the work with photorealistic images. This combination of three phases implies that you provide us with your layout idea to scale with the sizes of the objects inside, then we propose a stylistic idea and create a photorealistic model of your space. At the same time we make up a detailed specifications list of furniture, lighting, decoration materials and other decorative elements based on the approved style. When the specifications list is done, we approve it with you and present a package of previews of photorealistic images of your interior (a package of several images - 1 panorama for each 20 sq.m. included in the "Panorama" module and a package of 4 angles of camera is included in the "Perspective" module). After the approval of the images, we create the final angles of "Perspective" in high resolution and proceed to the final stage: the preparation of all the necessary project documentation with which workers can start construction. Having the specification and an understanding of the interior style, you will be able to quickly arrange your space at the end of the construction work by simply following the list and the photorealistic images. Three sets of amendments are included in each of the phases of work with documentation and one set for the work with photorealistic images. This combination consists of four phases. We select the best layout idea for your space based on your wishes, then we propose a stylistic idea and create a photorealistic model of your space. At the same time we make up a detailed specifications list of furniture, lighting, decoration materials and other decorative elements on the basis of the approved style. When the specifications list is done, we approve it with you and present previews of photorealistic images of your interior (a package of 20-30 angles of camera included in the "Visualization" module, a package of 4 angles of camera is included in the "Perspective" module and a package of several images - 1 panorama for each 20 sq.m. included in the "Panorama" module). After the approval of the images, we create the final images in high resolution and proceed to the final stage: preparation of all the necessary project documentation with which workers can start construction. Having the specification and an understanding of the interior style, you will be able to quickly arrange your space at the end of construction by simply following the list and the photorealistic images. Three sets of amendments are included in each of phases of work with documentation and one set for the work with photorealistic images. This combination of three phases implies that you provide us with your layout idea to scale with the sizes of the objects inside, then we propose a stylistic idea and create a photorealistic model of your space. At the same time we make up a detailed specifications list of furniture, lighting, decoration materials and other decorative elements based on the approved style. When the specifications list is done, we approve it with you and present a package of previews of photorealistic images of your interior (a package of 20-30 angles of camera included in the "Visualization" module, a package of 4 angles of camera is included in the "Perspective" module and a package of several images - 1 panorama for each 20 sq.m. included in the "Panorama" module). After the approval of the images, we create the final angles of "Perspective" in high resolution and proceed to the final stage: the preparation of all the necessary project documentation with which workers can start construction. Having the specification and an understanding of the interior style, you will be able to quickly arrange your space at the end ofconstruction by simply following the list and the photorealistic images. Three sets of amendments are included in each of the phases of work with documentation and one set for the work with photorealistic images. Start to fill the basket, so that we can give you more details on the cost of work on the order. that you need all of the selected units at once, you can order them separately later. Do you want to send us your result? photographs and sketches of your space if you wish. to contact us by WhatsApp, iMessage, FaceTime. Your configuration has been sent. We will get back to you shortly between 10am and 10pm Moscow time. Talk to you soon! 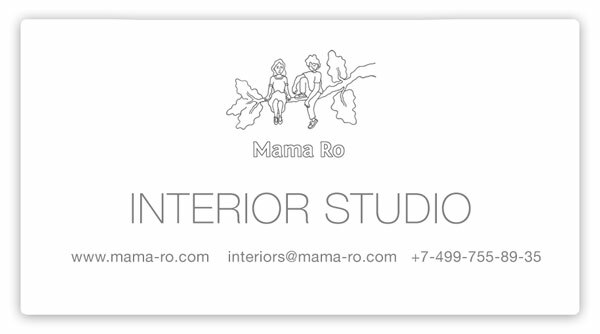 type "Mama Ro" or "Interior studio"